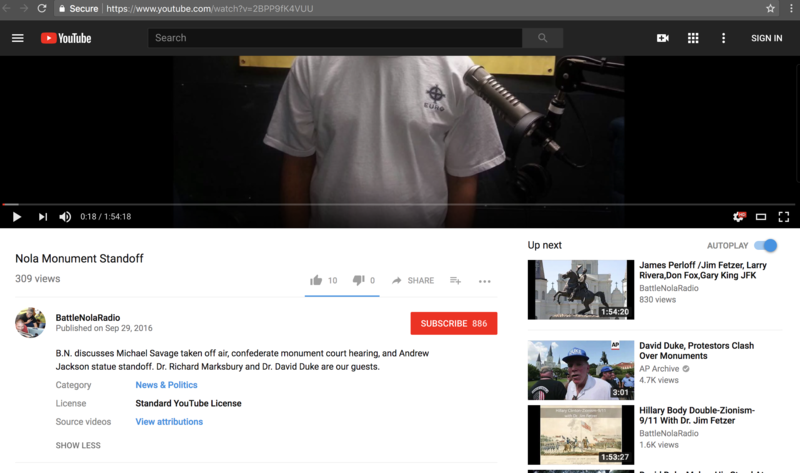 Never one to turn down an interview, he appeared at least five times on The Battle of New Orleans, a radio show on WGSO 990AM that was eventually shut down due to constant anti-Semitism, threats on local activists, and use of racial slurs on air. 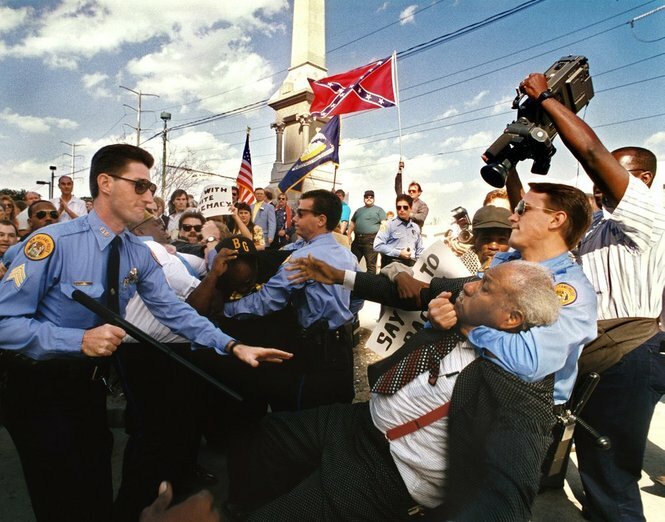 The Battle of New Orleans hosted such guests as William Finck, the leader of the white nationalist League of the South, Mark Weber, the head of America’s largest Holocaust-denial organization, and – this being Louisiana – David Duke. Marksbury’s interviews with Battle of New Orleans show how the more radical, alt-right lovers of the Confederacy blend into the more respectable, button-down Lost Causers. In talking to Marksbury, when host Nathan Laurenson refers to Mitch as a “United Nations / Soros-sellout whore of a mayor,” or “Mitch the Globalist,” Marksbury’s response is not to rebuke these bizarre assertions but simply to ask the audience to support him in his nuisance lawsuits and go-nowhere petitions. 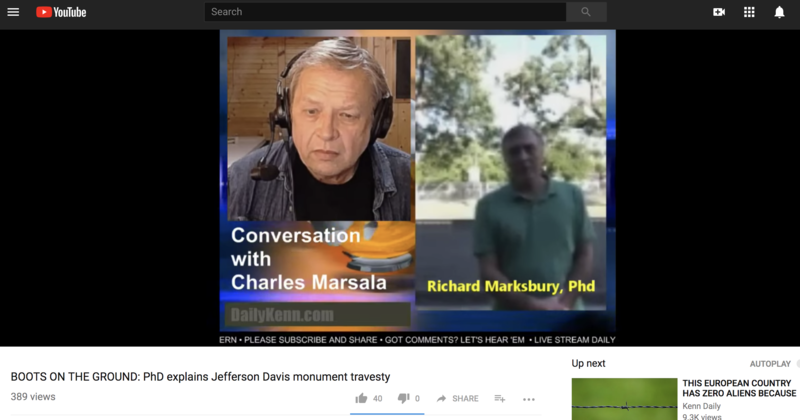 Marksbury has also appeared with Charles Marsala on the Daily Kenn, a white supremacist website hosted by someone who believes that white people are “in the aggregate” smarter than African-Americans or Latinos. Here’s the rare double-self-own, as Stacy Head and Richard Marksbury discuss why Bienville’s statue should be taken down. And now, after months of complaining about Landrieu’s process and the lack of a city-wide vote, Marksbury and his committee have unilaterally (and secretly) decided what to do with the monuments. Can we please send him back to Yap?